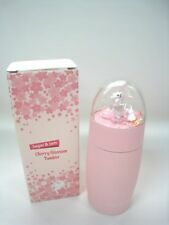 Sugar & JamCherry Blossom Tumbler. ETUDE HOUSE . Tumbler lined with stainless steel designed to keep beverages. Let us know if you delayed. Other Countries. Brazil, Malta, Russia, Israel. Middle East, Saudi Arabia, India. Coordinates with other products in the Margaux Collection. Includes frosted-glass tumbler. KOHLER finishes resist corrosion and tarnish. Finish: Polished Chrome. Premium metal construction for durability. Waterford Crystal Ardan Collection Mara Tumbler GlassesWaterford Crystal Ardan Collection Mara Tumbler Glasses. Set of 6 glasses. Lead Crystal. Height:9.8cm Width: 8.3cm Depth:8.3cm. Brilliant Tumblr provides neatness and class to any bathroom Luxury resin Quality home Decour with innovative and distinctive craftsman ship Hand wash Standard size is 5 inches in height by 2.5 inches in width Houndstooth Tumblr is part of an innovative collection of oversized duotone pattern in black-and-white of abstract for pointed shapes. The Tumblr is finished with a thick layer of resin and a satin black band, over the modern black and white checks. 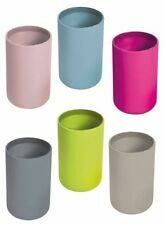 It is perfect for a drinking cup in any room and designed to give any room a splash of class and style. It is necessity when it comes to any bathroom and create it with soft edges for a comfortable feel. Wipe clean with soapy water. Color black and red with white background. Imported from France, made in PRC. 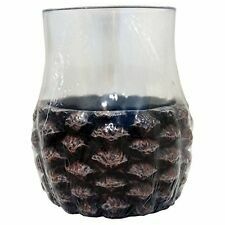 Accessorize your bathroom countertop in an urban style with this charming tumbler! HIGH-QUALITY: This bath countertop tumbler is made of smooth dolomite which is rust free. Courtly Check® Tumbler. Add one in the powder room, a pair on your bedside tables, and a stack in the kitchen so this charming cup is always within reach. The simple elegance of our most popular pattern makes it part of a useful gift set to accent any decor with matching soap dish, tissue box cover, and waste bin for the bath or with a Courtly Check® Pitcher in the kitchen. 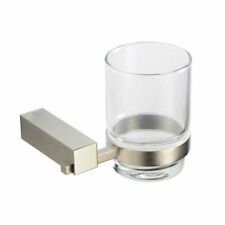 Horus Montmartre model 102.07.604 bathroom accessory - brass wall-mountedcup tumbler in Oil-Rubbed Bronze finish / toothbrush holder cup in porcelain. 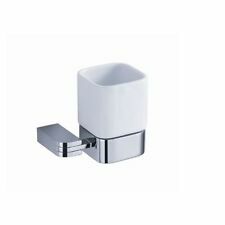 Porcelain cup tumbler (included) can be removed from mounting and used to rinse your mouth or as a decorative toothbrush holder. Originally marketed by Blonder. Artwork from Linda Spivey. Wonderful Linda Spivey Quality. Country Cats Cup Mug Tumbler. This Country Scene looks like it has been handpainted. Made in Japan, Laura Ashely by Bathelle Fashions, Trenton, NJ. The beautiful Saxony bath ensemble brings a glamorous, luxurious appearance to your bathroom. What a fun way to update your lodge decor! Size is 4 1/2" x 3". High quality resin base. Three Water Tumblers by Grainware carlisle. Very simple elegant Barrel shape and style. With the word "WATER " etched into the tumbler.About 4.5" tall. Two are Unused with no wear. One of them is still with the sticker. For caffeine junkies or the chronically thirsty, this oversized mug is an absolute lifeline with its abundant capacity—this giant holds nearly a half-gallon of liquid! Features plastic liner, screw top, flipper opening, and sure-grip handle. Nick Jr's Peppa Pig is a beloved character for children. What better way to make your child happy than with a cup featuring their favorite character. This 16oz Sports Tumbler features Peppa Pig and Friends. Item comes with ONE cup, ONE straw and ONE lid. BPA Free, Material is Approved for Food Use, Not Dish Washer Safe Please Note: All merchandise listed for sale is officially licensed, 100% authentic for worldwide distribution. Tommy Bahama Sandy Palms Tumbler Toothbrush Tan Porcelain Palm Trees 4.5 x 2"
Tommy Bahama Sandy Palms. Tumbler or Toothbrush Holder. Tan Porcelain Palm Trees 4.5 x 2". I have a nice set of Andre Richard Toothbrush holder and rinse cup with nice floral pattern with butterfly. Popular Sahara Beige Marble has been used in crafting this three piece bathroom accessory set. It has been designed and produced exclusively for Sahara Beige Marble. Onyx and Marble are natural stones and are bound to have variations in color & texture. Tommy Bahama Sandy Palms Toothbrush Holder Tan Porcelain Palm Tree 4.5 x 4.25"
Tommy Bahama Sandy Palms. Toothbrush Holder. Tan Porcelain Palm Trees 4.5 x 4.25". [Etude House] 2018 Water Bottle Tumbler With Straw & Handle. Straw included. CARE: Wipe clean with damp cloth or hand wash. SIZE: 4”H x 2.5”W. Dragonfly Tumbler. 4"H x 3"W x 3"D. Dragonfly graphic. Wipe clean. 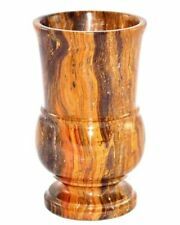 2 Wall-Mounted Tumbler features satin nickel finish with unique Wenge wood base. Wenge is an exotic, very dense dark hardwood from Central West Africa. It contrasts beautifully with the satin nickel finish. Croscill "Bermuda Sands" Bath Tumbler. Raised seashell design (not real seashells). White, blue, iridescent-type look. Featuring rich colors, striking prints, and luxurious textures, this chic bath Tumbler is sensual and alluring just like Sofia herself. Honey finish. D x 3.375 in. W x 4.5 in. Color/Finish Natural. Manufacturer SKU 70101. Pretty tumbler has a soft green base with a scroll pattern, a raised butterfly and embossed tone on tone fern design. Background is a soft cream color. A nice addition to your garden bath. See matching shower curtain in my store. Wenge is an exotic, very dense dark hardwood from Central West Africa. See full specifications above. CONTENTS: Wall-mounted tumbler holder, ceramic tumbler, installation screws and drywall anchors. MODERN DRINKWARE: A pair of 10 oz old fashioned whiskey glasses with a twist design. EXQUISITE DESIGN: Thin lip of glass allows delicate sipping, for better appreciation of complex flavor. DURABLE GLASSWARE: The unique twist design creates prismatic effect to impart different hues to the beverage, and makes glass easier to hold. **Hand wash only** Whiskey not included. SPECS: 3.7 H x 3.7 L x 3.7 W (each glass, in inches) . Alno is the designer's choice providing unique designs from one source for fine decorative cabinet hardware, bathroom accessories, mirrors, and mirror cabinets. As a handmade and finished product each piece of cabinet hardware may have slight variations within a lot, color, and or finish. Pine Bluff Tumbler. Nice country colors of green, brown, and cream. If this is not possible, I will let you know right away. 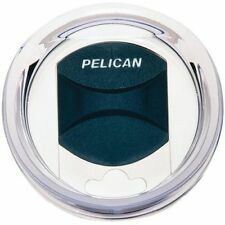 Multi Green Onyx bathroom accessories canister of Pacific Collection. Marble & Onyx being natural materials are bound to have variations Hence each item can have a slight deviation in color and texture from the displayed picture.